Just wanna say 'hi' again, to everyone and to welcome Fanpop users, visiting this club. Anywies, I have a fun challenge, especially to those who aspire to become great artists, mangaka authors and animators, in the future. Let's make this, as our drawing practice. Draw Shouko Nishimiya from Koe no Katachi, cosplaying or dressed up as Mirai Kuriyama from Kyoukai no Kanata. Either in 'chibi form' or the 'normal form'. Free-style. 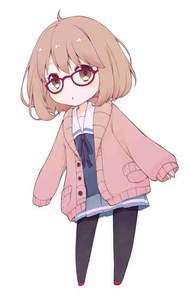 Here is a photo sample of Mirai, if you wanna know, what she looks like, okay? (Although, she's in chibi form. . .ehehehe). Then, post your drawings, through scan or camera pic (if traditionally made), or if made in digital style, post it straight - and submit it with your names, within the post.